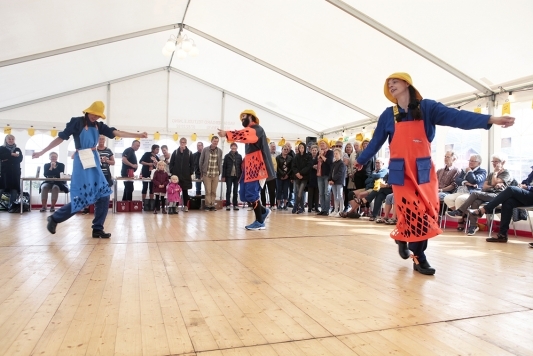 A new folk dance based on manual movements and village life developed in dialogue with local workplaces, schools, associations and stakeholders, as well as individuals in the fishing village of Thyborøn. At 2 pm people are queuing outside around the 98-m2 tent with a wooden floor that has been erected in the harbour on the square with the anchor. Over the past five days the tent has been our studio, where we have rehearsed and prepared for today, December 10th, when we will present the The Thyborøn Trawl Dance. The tent is packed with people of all ages. Chairs are lined up around the edges. Towards the entrance people from Thyborøn sailing club are busy arranging cake and coffee. 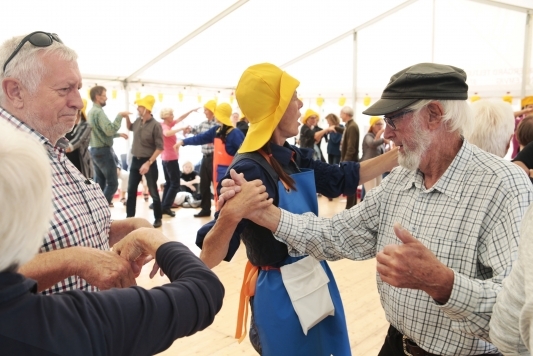 The only decoration is 80 laminated yellow flags ready for the dance, with words like ‘fishcakes’, ‘truck’, ‘amber digger’, ‘salted fish, ‘dragnet knot’ and ‘whippy ice cream’ – all words or terms that now exist as moves that can be integrated in the The Thyborøn Trawl Dance. People are still queuing outside the tent as we start to introduce the new local dance, overwhelmed and delighted at the massive turnout. Before long everyone is on the dance floor. People are taught the special ‘shake hands with dried fish’ grip. We begin and start circling in a chain dance. We do ‘truck’ moves, the ‘dried fish/wet fish’ dance, a wooden clog dance like upright Cossacks. 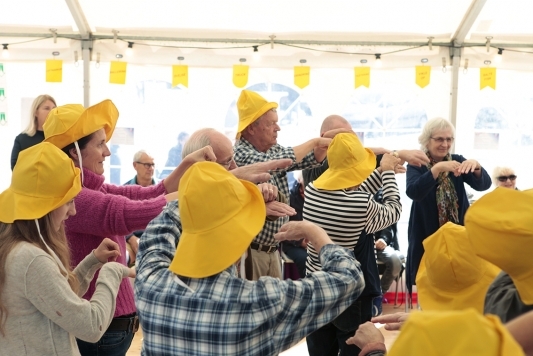 We dance the ‘seal safari’, the ‘fish filleter’, the ‘amber dig’, clap each other on the back and continue in a long line in the ‘train run’, moving to the rhythms of sampled fragments of the song VLJT by the Thyborøn band Tørfisk (‘Dried Fish’). The ‘train run’ turns into the ‘sea snail’, where we mince around taking tiny steps that turn into the ‘shoal of fish’, before finally stopping, frozen in the ‘fishing net’. All of it accompanied by music that is a mix of rhythms, seagulls cries, elements reminiscent of folk music, and the music of the band Tørfisk seasoned with sound recordings from workplaces in Thyborøn. In August 2016 we, performance artist Molly Haslund (DK) and composer Will Owen (US), visited Thyborøn for the first time to develop the idea of a performance work for the fishing village. Later, during a three-week stay in March 2017, we visited local residents and workplaces and saw what hard-working people the villagers of Thyborøn were. Talking to people, we also discovered that the village had no local folk dance of its own. So we decided to make a unique, performative local dance for Thyborøn based on local work structures and concrete manual movements on the job, including in the fishing industry. It was a prolonged process, because it was important for us to involve and integrate as many aspects of village life as possible in the finished work. During the third and final stage of the project from August 18th- September 10th we were back in Thyborøn where we started our collaboration with the choreographer and performer Helle Fuglsang, who helped us develop the dance. This took place at venues like Thyborøn School, with a four-day presentation and workshop with classes aged 12-14. 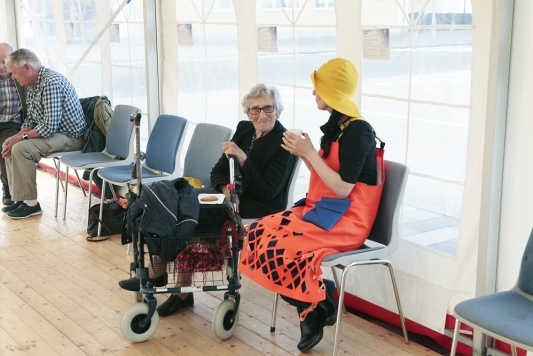 Designer and textile artist Siff Pristed also designed a set of costumes inspired by working clothes, especially those worn in Thyborøn’s fishing industry, combined with traditional folk dancing dress. These costumes were the outfits we wore when we were in town teaching people the dance – a performative element on the streets as well as in the final performance. The Thyborøn Trawl Dance was a part of the video and performance festival, MEETINGS, which took place from September 1st-10th, 2017. MEETINGS was organized by the association ET4U, Nees, in collaboration with a number of other associations, institutions, and volunteers. 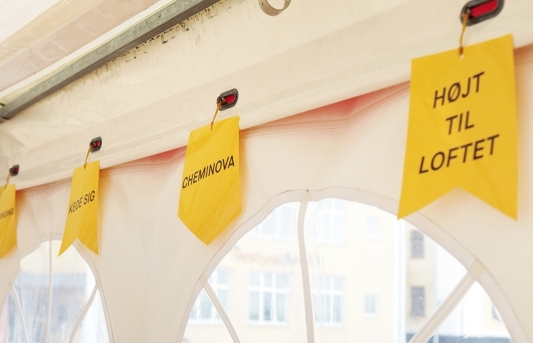 62 artists from 21 countries showed 64 works at 26 venues in central and western Jutland. MEETINGS is funded by the Culture Agreement for Central and Western Jutland 2015-2018 (The Ministry of Culture), European Capital of Culture Aarhus 2017, Lemvig Municipality, The Obel Family Foundation and The Danish Arts Foundation. 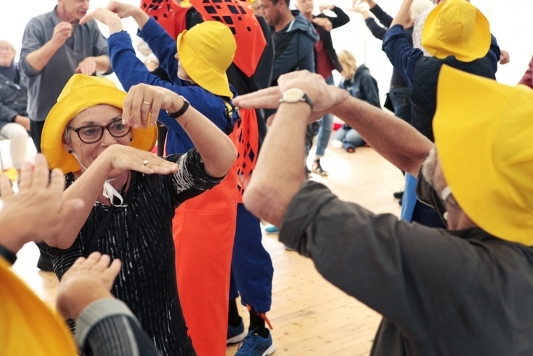 The costumes and graphic materials from The Thyborøn Trawl Dance are exhibited at the Coastal Center of Thyborøn February 9th–November 1st 2018. Opening hours 10 am–4 pm. Admission fee.